More sideways movement with a small inside day fits all four Elliott wave counts at this stage. Summary: Gold remains in a sideways consolidation phase which began on March 27th. Since price entered the consolidation phase the strongest volume is on down days, indicating that when the breakout comes it may be more likely to be down than up. Volume continues to decline, which often happens towards the end of a consolidation phase. However, the Elliott wave picture remains unclear. A new high above 1,209.30 would invalidate wave count 1 at this stage. A new low below 1,184.04 would invalidate wave counts 1, 2 and 3 at this stage. That would leave only wave count 4 as valid. A new high above 1,224.35 would invalidate wave counts 1 and 4, leaving wave counts 2 and 3 valid. To see weekly charts for bull and bear wave counts go here. Wave counts 1 and 2 follow the weekly bull count, wave counts 3 and 4 follow the weekly bear count. So far within cycle wave b there is a 5-3 and an incomplete 5 up. This may be intermediate waves (A)-(B)-(C) for a zigzag for primary wave A, or may also be intermediate waves (1)-(2)-(3) for an impulse for primary wave A. Within cycle wave b primary wave A may be either a three or a five wave structure. Intermediate wave (A) subdivides only as a five. I cannot see a solution where this movement subdivides as a three and meets all Elliott wave rules. This means that intermediate wave (B) may not move beyond the start of intermediate wave (A) below 1,131.09. Intermediate wave (B) is a complete zigzag. Because intermediate wave (A) was a leading diagonal it is likely that intermediate wave (C) will subdivide as an impulse to exhibit structural alternation. If this intermediate wave up is intermediate wave (3) it may only subdivide as an impulse. At 1,320 intermediate wave (C) would reach equality in length with intermediate wave (A), and would probably end at the upper edge of the maroon channel. 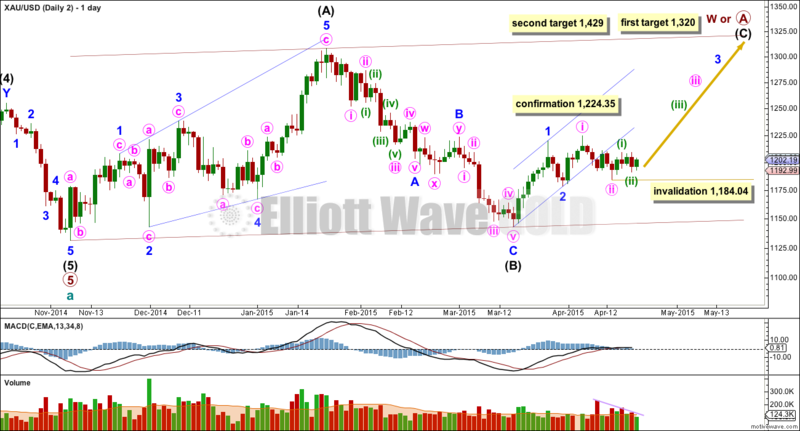 At 1,429 intermediate wave (C) or (3) would reach 1.618 the length of intermediate wave (A) or (1). If this target is met it would most likely be by a third wave and primary wave A would most likely be subdividing as a five wave impulse. Within intermediate wave (C) minor wave 2 is seen as a double combination: zigzag – X – triangle. The triangle for minute wave y would be about only halfway through. 1. Combinations are reasonably common structures. 2. On the daily chart MACD is hovering at zero. This sideways chop of the last 11 days does look like a possible triangle. 3. The upwards wave labelled minute wave x does look like a three on the daily chart. Within the triangle of minute wave y minuette wave (c) may not move beyond the end of minuette wave (a) below 1,184.04. If minute wave y is a contracting triangle then minuette wave (d) may not move beyond the end of minuette wave (b) above 1,209.30. If minute wave y is a barrier triangle then minuette wave (d) should end about the same level as minuette wave (b) at 1,209.30, as long as the (b)-(d) trend line is essentially flat. 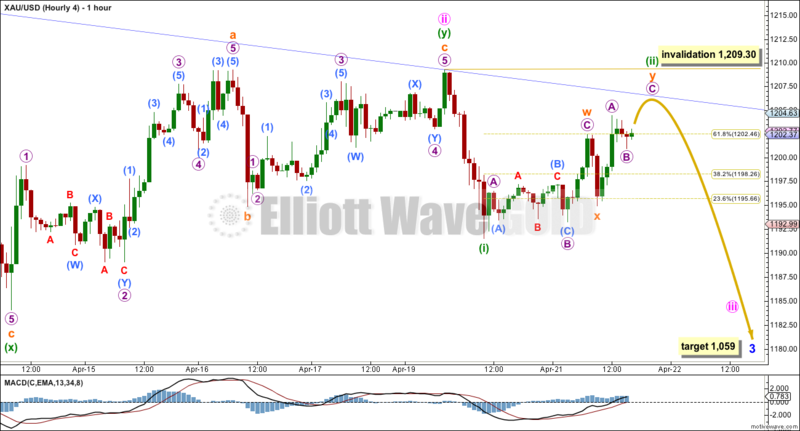 In practice this means that minuette wave (d) may end slightly above 1,209.30. This is the only Elliott wave rule which is not black and white. For this wave count 1 I would expect sideways choppy movement for much of this week. The breakout would be expected to be upwards. Volume continues to decline indicating Gold is still in a consolidation phase which is nearing maturity. If the breakout is upwards is should come with a substantial increase in volume for an up day when it happens. The hourly charts today will all show movement since the low at 1,184.04. This first wave count sees movement since 7th April as a regular contracting or regular barrier triangle. Only waves (a) and (b) are complete, and both subdivide best as single zigzags. This means that one of the remaining sub waves should subdivide into a more complicated and time consuming double, or possibly a triangle to complete a nine wave triangle. The final wave of the triangle for minuette wave (e) would be most likely to undershoot the (a)-(c) trend line, and less likely to overshoot the (a)-(c) trend line. Upwards movement for the small green candlestick of Wednesday’s session subdivides as an incomplete double zigzag. For wave count 1 this would be subminuette wave b within the zigzag of minuette wave (c) of the triangle. Within the zigzag of minuette wave (c) subminuette wave b may not move above the start of subminuette wave a at 1,209.30. This invalidation point will be black and white for the next 24 hours. 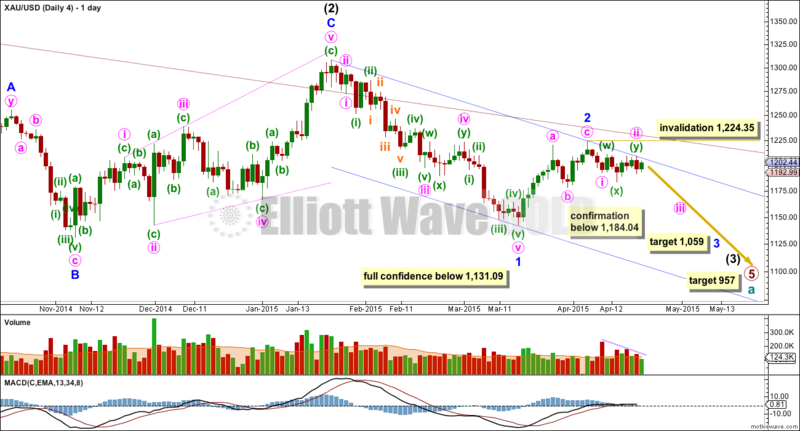 Minuette wave (c) of a contracting or barrier triangle may not move beyond the end of minuette wave (a) below 1,184.04. This invalidation point will remain black and white while the triangle is completing. Wave count 1 expects the most sideways movement, and the breakout for this idea may not come until next week. This wave count is identical to wave count #1 up to the high labelled minor wave 1. Thereafter, instead of minor wave 2 continuing it sees minor wave 2 as complete, within minor wave 3 minute waves i and ii complete, and now within minute wave iii minuette waves (i) and (ii) are also complete. 1. 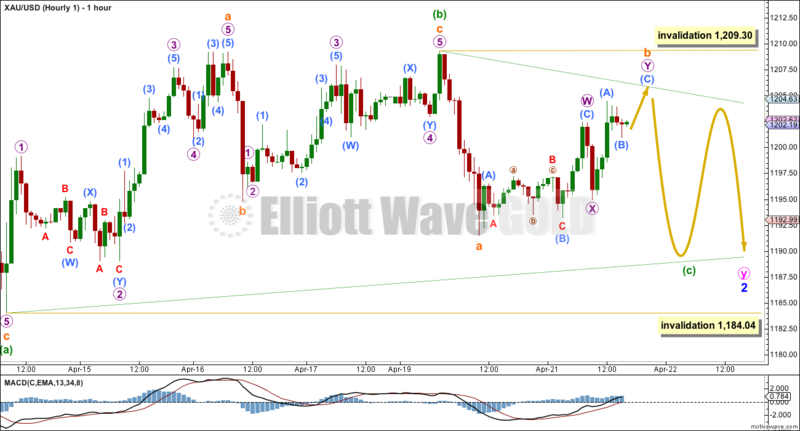 Minute wave ii looks like a clear three wave movement now on the daily chart. 2. Minor wave 3 should show its corrections for minute waves ii and iv clearly on the daily chart. 1. Minute wave ii clearly and strongly breaches the lower edge of a base channel drawn about minor waves 1 and 2, one degree higher. 2. Minute wave ii is twice the duration of minor wave 2 one degree higher. 3. The upwards wave of minute wave i looks like a three on the daily chart, but it should be a five. 4. If the middle of a third wave began on Wednesday it should be associated with higher volume, but volume for Wednesday is lower. Within minute wave iii no second wave correction may move beyond its start below 1,184.04. Minute wave iii should be beginning to show a strong increase in upwards momentum and an increase in volume. It is not really showing much increase in upwards momentum, and it is showing declining volume. This is an indicator that wave count 2 is likely wrong. So far within minuette wave (iii) a series of overlapping first and second wave corrections may be complete. Alternatively, minuette wave (ii) may not be over and could continue sideways as a double flat or double combination. The invalidation point is left at 1,184.04 to reflect this possibility, which could explain the lack of volume. At 1,304 minute wave iii would reach 1.618 the length of minute wave i.
Minuette wave (ii) may not move beyond the end of minuette wave (i) below 1,184.04. This wave count follows the bear weekly count which sees primary wave 5 within cycle wave a as incomplete. At 957 primary wave 5 would reach equality in length with primary wave 1. This wave count is today adjusted to see minor wave 2 as an incomplete zigzag, and within minute wave b a close to complete running contracting triangle. When the triangle is complete then the zigzag for minor wave 2 should end with a small wave up for minute wave c. It should find strong resistance at the upper edge of the maroon channel copied over here from the weekly chart. If this maroon trend line is breached again by a full daily candlestick above it and not touching the maroon trend line then this bear wave count should be discarded. 1. The upwards waves of minuette waves (b) and (d) do look like threes on the daily chart. A triangle nicely explains the sideways chop of the last 18 days. 2. MACD supports the idea of a triangle unfolding as it is hovering at the zero line on the daily chart. 3. Volume supports the idea of a triangle (a typical consolidation phase normally sees declining volume towards its end). 1. Minor wave 2 would be much longer in duration than a minor degree second wave normally is for gold. The triangle of minute wave b may be almost complete. Thereafter, an upwards breakout for minute wave c would be extremely likely to move price at least slightly above the end of minute wave a at 1,219.99 to avoid a truncation. Minute wave c may be 0.618 the length of minute wave a at 48 in length. It is possible that minute wave c may end above 1,219.99 but below 1,224.35, giving a “false breakout” before a downwards trend begins with strength. Minute wave c does not have to make a new price extreme beyond the running triangle of minute wave b to avoid a truncation, and only needs to move beyond the end of minute wave a. Minor wave 2 may not move beyond the start of minor wave 1 above 1,308.10. Within the triangle one of the sub waves is already a more time consuming complicated double, so the final wave of minuette wave (e) is likely to be a simple zigzag. Within the final zigzag of minuette wave (e) subminuette wave b may not move beyond the start of subminuette wave a above 1,209.30. Minuette wave (e) may not move beyond the end of minuette wave (c) below 1,184.07. Minuette wave (e) would be most likely to undershoot the (a)-(c) trend line, but it may also overshoot the (a)-(c) trend line. This third wave count still expects to see more choppy overlapping sideways movement for another day or so as minuette wave (e) takes its time. The zigzag for minuette wave (e) should be a clear obvious three wave structure. Within it subminuette wave b should find strong resistance at the upper (b)-(d) trend line (green) of the triangle (triangle trend lines normally provide strong support and resistance while a triangle is unfolding). Subminuette wave b is an almost complete double zigzag. Only one more high is needed to complete the second zigzag in the double. Thereafter, subminuette wave c downwards should unfold as a five wave structure, and is extremely likely to make at least a slight new low below the end of subminuette wave a at 1,191.48 to avoid a truncation. This wave count is identical to wave count 3 up to the low labelled minor wave 1. Thereafter, it still sees minor wave 2 as a completed zigzag, and minor wave 3 in its very early stages. Minute wave ii is seen as a completed double combination. 1. The proportion of minute wave ii looks right. 2. Upwards movement continues to find resistance at the upper edge of the blue base channel drawn about minor waves 1 and 2. 3. It is very common for a third wave to begin with a series of overlapping first and second waves. 4. If Tuesday’s session is a small correction within a downwards trend then it should have lower volume. At 1,059 minor wave 3 would reach equality in length with minor wave 1. The blue base channel is copied over to the hourly chart. Upwards movement perfectly ends when price touched this trend line. For wave count 4 use this trend line to show where minuette wave (ii) should end. If price gets that high it should again find strong resistance at that blue line. 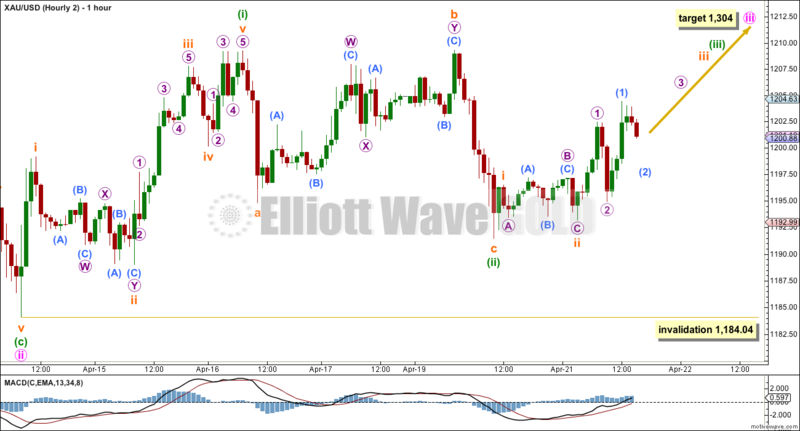 Minuette wave (ii) for wave count 4 should show up on the daily chart. 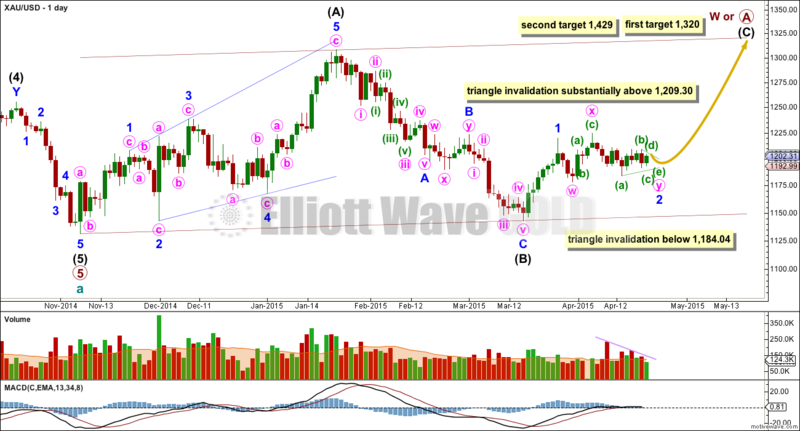 For Gold, within its extended third waves, the second and fourth wave corrections normally show on the daily chart so that the third wave impulse has a clear five wave look to it. Minuette wave (ii) is an almost complete double zigzag. When minuette wave (ii) is complete then this wave count expects the middle of a third wave to begin to develop an increase in downwards momentum. A new low below 1,184.04 would now provide a reasonable amount of confidence in this wave count. If I had to pick a winner it would still be wave count 4. However, it has too many problems for me to have confidence in it. I would wait for price to indicate which count is correct. This analysis is published about 05:34 p.m. EST. I am glad Gold has had a “had a nice run over the past several weeks” . Somehow choppy with downwards bias has become a “nice run” . This “nice run” is over . Hopefully someone will stop hogging the forum now . A few amateurish thoughts from someone who trades with simplistic support/resistance and momentum cues and has no “edge” in the market and posts too many charts ;-). GDX has had a nice run over the past several weeks, and yes, today my positions took a hard hit but my stops weren’t taken out as GDX still is supported by BBand midpoint and it’s components still look bullish and constructive. I suspect I’m in the severe minority being bullish still today but until my supports and bullish structural cues no longer exist, I will keep bullish. Mind you, any further weakness tomorrow in the GDX will likely stop me out. Also if a bounce from here forms a bearish structure I will likely turn short as well. Here are a few hubris-free charts to show what I’m looking at in case they are helpful to anyone. GDX 30-min structure. Note the structure since Apr 16th looks like a bullish Wolfe Wave for those familiar. GOLD showing a bullish flag structure following breakout. NUGT structure is actually a better ascending triangle now than it was a few days ago with a bullish flag possibly setting up the breakout. Analysis is published already. Good luck everyone! I will continue to enforce the comments guidelines firmly. If you wouldn’t say it to your grandmother like that, don’t say it here. Comments which do not meet this high standard will be deleted, particularly if they offer no TA and no information relating to the market at this time. I expect comments to be collegial and focus on analysis of the market. Any complaints about my analysis should be directed to me via email or the contact form on this website. Gold’s failed attempt to break through near-term resistance at $1,208 was an “ominous warning” for investors, say analysts at Triland Metals. They add that the next price level to keep an eye on will be April’s earlier low at $1,183 an ounce. “This is the key pivot point for the medium term direction of this market,” they said. Despite the bearish momentum, the analysts are expecting prices to remain range bound between support at $1,175 and resistance at $1,225. 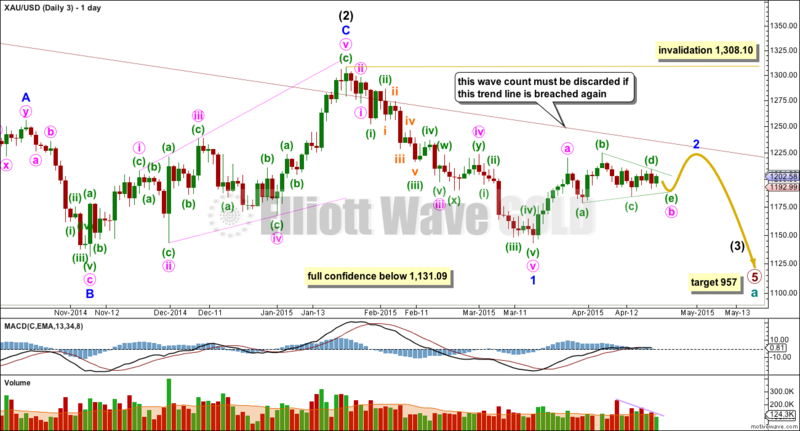 Once gold completes the down wave to below 1184.04 will price bounce in a corrective wave??? I think so, however it is a good timely question. Yes. Analysis was just published now. The very short term target is 1,184.81. Use the narrow channel on hourly wave count #4 to show when the downwards impulse is over and the upward correction to follow it has begun. Draw a Fibonacci retracement along the impulse. Use 0.382 and 0.618 as targets. They are about equally as likely. Well , one thing is for sure . Trendlines and stochastics are useless and when someone posts 200+ posts showing his channels and stochastics and is SO sure we are going up , it is sign of an amateur and it is time to bail on the long side . LOL . Been there , done that , been following the markets for 20+ years and know bs when I see it . You want to make money in the market , you need a special edge . And that edge is not in the forums or the blogs . My post will probably cause some intense responses but I won’t be here to review them . I am not subscribed anymore and I am just posting here on the free issue . You guys take care , see you . A VIEW: With a low range close can expect further downside continuation – wouldn’t go chasing it with the lower band at 1185/84…. Gold price would likely break back above 1189-91 for possible 1195+…. Upside is toast with 1206 on the outside. Let’s see how this closes today. Tomorrow is another day //// I am short from 1223/1211 and holding looking to add shorts unless something changes! //// Awaiting Lara’s update. On the hourly chart from the last high during this session at 1,205.02 I can see an impulse almost complete. The final fifth wave looks like it has begun. The very short term target for it would be equality with the first wave at 1,184.81. If that target is met it will most annoyingly leave all four wave counts valid. But the structure (if it completes as a five down not a three) very strongly favours wave counts 3 and 4. All four wave counts remain valid so I’ll present them all. I still favour wave count 4. 1,184.04 remains the price point which will differentiate bull and bear counts at this stage. I will look at wave count 1 and see if I can see an alternate way to see minor wave 2 which includes a new low below 1,184.04 at this time. If I find an alternate solution today I’ll publish it. If I find the solution later today I’ll publish it as an update. I think this is extremely important; the bull wave count still has much in it’s favour (most Ellioticians seem to prefer it) and while price remains above 1,142.82 I need to see if there’s another way for minor 2 to unfold. I’m off to complete charts and write that up now. Good luck everyone! The COT-data signals we are not rdy for hunting down to new lows. the specs not yet long enough for a collapse like your count number 4. I prefer count number 3. I am very happy with this count and want to thank you for posting it! It has taken a long time until i got a count im happy with ^^.count number 3 fits very well with my cot-analysis so far. but we have to see data becoming worse by the coming upwardmovement to finish minor wave 2. after that we should have the power to break the lows. but what if we go to 1175 before turning to the upside to finish minor 2. i really hope 1184 holds if a breach means you ll discard it. If you will discard number 3 by a breach below 1184 i fear some more weeks of trouble here with some headache. Why would most Ellioticians prefer the Bull count? I have had some correspondence with a prominent Elliotician who has several years experience, who very strongly disagrees with my bear wave count. We disagree, and that’s okay. But it did make me aware of the strong view that the bull wave count is the right one. And at the weekly chart level it does still have much in it’s favour. So far today is looking very close to your preferred Hourly 4. The US Dollar and gold sure reacted with fast strong momentum today to get gold down to day low at 1,185.80 at 10:53 am. Any feeling about gold either retracing up perhaps in a 2nd correction the rest of today or overnight? Or might gold still not be finished today’s drop before a worthwhile retrace up? Just asking because GDX is looking cheap if any chance of a bounce or risky if today’s drop has further down to next target before retrace up. And so close to major clarification and invalidation point at 1,184.04 that would leave only wave count 4. Thanks for any and all of your guidance. In the very short term a final fifth wave down. And yes, when that’s done it needs to be retraced by a three up which shouldn’t move above the start of the five down at 1,205.02 (today’s high). Lara , what would be the EW count under Waseem’s original chart below ? It fits neither bull nor bear wave counts. If I’m correct, it sees a rise up to about 1,300 followed by a fall to below current levels but not below 1,131. Which fits neither the bull nor bear EW counts. I see an impulse on the way down almost complete. It is entirely possible that 1,184 could be breached within the next few hours. I’ll present all four wave counts again today while price has not eliminated any. My only concern for wave count 4 this morning is volume. But that could resolve itself over the next couple of sessions. Hmm , no it sees fall to 1148 and THEN a rise higher than 1224 . Okay, I’m not reading it right then. I’m completely unfamiliar with the pattern so I’m not sure what it’s saying. Still, that too fits neither bull nor bear wave count. I find it an odd question actually. The question seems to be stating “this is the movement, what EW count would do that”. ATM I can’t see one. Geez , It is starting from April 1 and the prices are labelled on the right side . It is simple to read IF one takes the time to read it . And I don’t see what is ODD about my question at all . I thought it odd (and this is only my interpretation, which is certainly open to debate) because to me it looked like you were giving an expected direction for price and asking me to find a wave count which would do that. My approach to EW is the opposite. I look at the structure of waves and from there determine the direction. Your question seemed to be asking me to reverse that process, and that is what I saw as odd. It’s no negative comment on you, it’s only a comment on how I process the chart and how I do EW. That’s all. It is a daily chart with top at 1220 . This pattern shows that price can go to 1148 and by reaching there the pattern will complete and tehn we will get a buy signal…. In that pattern the price can move sideways but ultimately price will move to that target…. What about the no new high ? Pattern shows completion at 1218-1220 and price go to 1224. In harmonic trading There is no certain invalidation …… Price didn’t move and came back.. If price moves higher then this will be in play. but that didn’t happen…. With the lower band at 1185/84, I would take my money off the table here…. I struggle with exit points, I was going to wait and see if it could make 1184 when your post popped up. I sold and so far you look right , Thanks. Hello there Ram: Gold price downside targets ought to remain 117x-116x-115x…. (at least I have those in mind for myself)…. For now, with 1188 holding ought to expect gold price to get back up to possible 1198-1203… Personally, I am happy to have kept it short and holding. 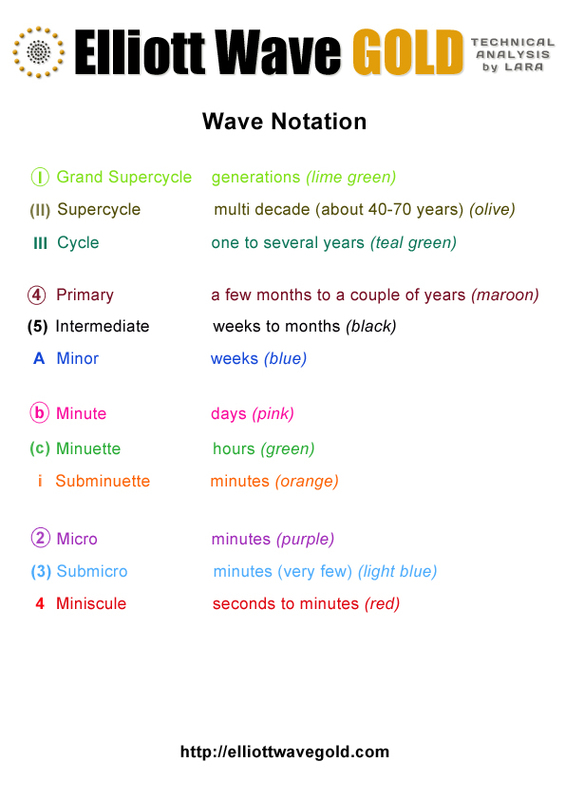 These wave counts by Lara are really fabulous and help a lot…. Happy days and good luck! Hold on, gold is going down – way down. I expect to more than double my portfolio by the time this wave 3 of wave 3 ends. I don’t advise it here as the up will be short. Thanks dean, I have no worries about any up side, holding shorts and in no hurry to liquidate them just yet, can always add shorts on the rise! Dean, back to your trading strategy. You have an exit plan–get out about 5 points before Lara’s target. What about entering a trade, what is your trigger for entering a trade? When all of Lara’s wave counts go in the same direction and trading is in session. Since I buy ETFs, my trading hours are limited to 7:30 am MST until 2 pm. Dean, I probably did not ask question clearly. For example, if Lara’s wave counts all align and you decide to trade a 3rd wave, do you enter trade at a certain point at end of 2nd wave or wait until proof of a 3rd wave etc ? As you have that 5 points before target to exit a trade, I thought you would probably have a specific target for an entry point ? Maybe not? I do not wait for confirmation if all of Lara’s wave counts are in the same direction. I don’t have a lot of detailed rules. Some of it is just feel after doing this for most of a year now. Reasons are just side noise. I only pay attention to the wave counts and use leveraged ETFs to make trades. If I told you how much money I was making off of Lara, you wouldn’t believe me. When Lara’s wave counts all go in the same direction, I trade JNUG when long gold and JDST when short gold. I exit trades about 5 points before Lara expects the wave to end. I trade all wave 3’s. I usually trade wave 1s and 5s too unless Lara doesn’t seem very sure of her count. For the quarter ended 12-31-14, I made 6 buys and sells and netted 53% on my entire account balance. For the quarter ended 3-31-15, I made 10 buys and sells and netted 110% on my entire account balance. So far in this quarter, I have made 2 buys and sells and am down 20%. I realize going all in is extremely risky, but it is working for me. Dean, very interesting and congrats. My strategy is similar, not quite as aggressive. I’ve had success, but not to your level. Dean, congratulations. I believe you and am very happy for your success. Was that before last week or so of limited range gold trading and 4 choices or even during that? I agree Lara is very helpful. Some here including myself may have some lessons to learn on making best use of Lara’s analysis. Or perhaps you have a helpful gut feeling/intuition with trends and buying and selling times? Any points you care to graciously share Dean? My losses in April have been while the gold market has been going sideways. If I had followed my own rules, the 20% loss would have been much less, but I was impatient. In fact, I was impatient again this morning. I felt like count #4 was going to happen and I was tired of waiting, so I bought JDST at $8.60. It is now $9.17. Not bad for one hour of investment. Hourly 2 doesn’t look like it is fitting with this current drop in Gold. This article comes close to Lara’s Grand Super cycle EW analysis for gold. Also includes a bounce to $1420 before going down to final low. I always chuckle at the hubris that spills over in these articles. Everyone acts like they KNOW what is going to happen. Nobody knows….but we can respond to what the market throws at us and profit accordingly. Thanks for posting….entertaining and just as likely to be correct as anyone’s opinion. lol . I am sorry but this is hypocrisy . Hubris ? Let’s look at your posts ( probably 100+ ) over the last weeks and you will see the definition of hubris . I never claim to know where the markets are going. I simply have been sharing my charts to show my rationale for entries and exits and a trading strategy. I will keep it to myself for now on as it’s clear I’m rubbing some folks the wrong way. Mark, that’s the hubris. Are you posting your point of view because you choose or are you only going to do it if it’s accepted. I’m just sharing ideas. I assumed this was a forum for showing technically based rationale. It doesn’t matter if anyone agrees with my perspectives but I truly don’t want to post ideas and points of view if it bothers folks. That’s the hubris…that you think your posts bother people (or vice versa). People choose how they feel and react, your commentary does not have the power to do that. So choose to post or not to post. People will do what they do. I suppose I understand your point. However, I don’t expect my posts to bother anyone and then today it did and I’m just sensitive to not wanting to be an over-posting guy on here (i.e over 100 posts etc). I’m going to throttle back….thanks for the feedback on this. Mark, your post DID NOT bother anyone. You posted, someone choose to respond a certain way, that’s it. Your posts have no control over how someone responds. I’ve really appreciated your charts and posts, Mark, for what its worth. At least this novice found them helpful. Exactly. And I’m a bit surprised sometimes at how people speak to their grandmas. Its a tough one, and a few comments are borderline sometimes. We have members who are new to trading and inexperienced, we have a few CMTs here and members who are brokers or fund managers. With such a wide range of experience and knowledge it’s important everyone is patient and polite. That’s how we’ll learn. The internet is too full of nastiness, I’m not going to let this website be part of that. This is exactly what this comments section is for. Keep sharing charts and TA. Its okay if not everyone agrees with your view or your confidence. We’re all here to learn. Mark F, I (and expect many others) appreciate your charts and comments. Your opinion as valid as any other. Ultimately the market determines validity of various opinions. 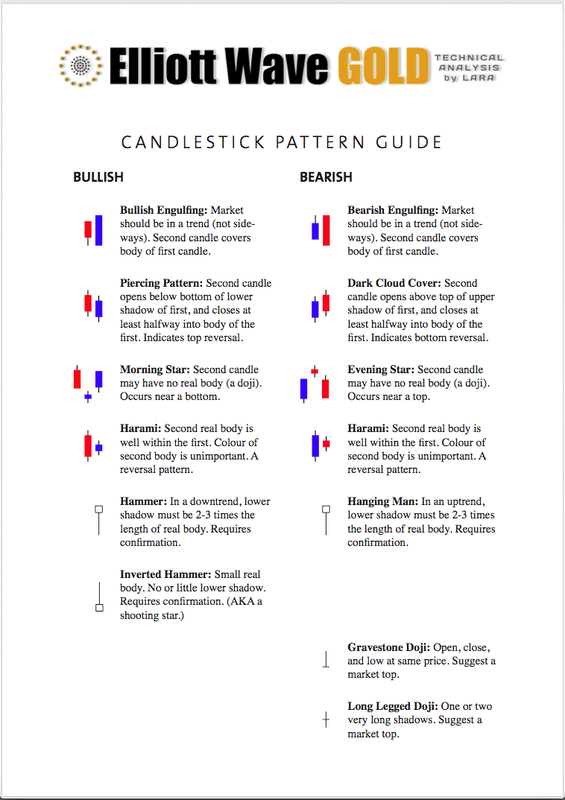 Mark F, keep the charts coming, as many find them useful. A negative remark or two against a comment or two of yours is as you say just Noise or a difference of opinions. Do you read the updates in full? Hi. Whichever wave count works does not really matter, my view and trade is for the short side for as long as gold price remains under 100dma (1210-11) with upside risk 1219-20 with 1224-25 on the outside. Perhaps I would chose wave count 1 and 4. For my trade, once Gold price is able to sustain and stay above 1216-17 then I may consider to switch to the long side. It is a little frustrating though not to see gold price drop below 1190. With ADX weak for the downside, Gold price remains bottomy for now. I’m not going to put numbers on them. There are too many possibilities. I’d just be picking numbers out of the air, not helpful. I will say though that the probability of a downwards breakout is more than 50% because volume so strongly supports a downwards breakout. Of the two bear wave counts it is wave count 4 which has the least problems. A VIEW: Gold price appears to be stalling between 1200-1198; it remains to be seen if it can rise past 1202-05 to take out 1207-08 for possible 1210-11…. A good downward move is possible (for a break below 1196 to target 1193-91) however, an up move is a little concerning short term. Dang!